Hey, ladies! It’s Lynn, back today to share something with you that has been so helpful for me: a Consequence Chart for Moms and Kids. 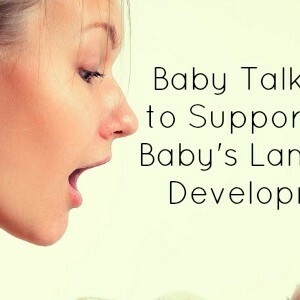 It’s really very simple but will go a long way toward saving a busy mom’s sanity! As parents, we have to handle all kinds of situations with our children, and discipline is just part of our job. Using this tool will help you know what to do in those frazzled moments when you don’t know what to do! 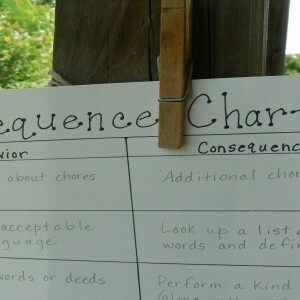 This handy little consequence chart will cut down on frustration for moms and kids. When my oldest kids were young (and my youngest were even younger), I found that I got frustrated trying to decide what to do about each little incident that occurred. I don’t know about you, but sometimes it’s hard for me to think of a creative, effective consequence for a behavior while several other things are going on around me (and possibly several other children are needing my attention, as well.) I wanted the punishment to fit the crime, if you will, and to be well thought out and (here’s a biggie) consistent. It was hard to achieve all those things with just knee-jerk reaction discipline. Even when I thought of a really good idea, I didn’t always remember it when the time came that I needed it. Enter the handy-dandy little consequence chart. I decided I needed a plan. I am a planner and a list-maker, so I put those things together to decide how I would handle misbehavior. I first ordered a chart similar to this from a curriculum company I liked, but later made my own and liked it better. Whenever you notice a behavior you want to address, jot it down. List the misbehaviors and their corresponding consequences on some diy graph paper. (I used pencil to fill in the blanks, to allow for tweaking later. *The chart shown is for illustration purposes only. When the next situation occurs, you and your child can “take a trip to the chart” to see what needs to happen. Speaking from experience, this cuts down on stress for mom while helping kids have a clear understanding of expectations. You can also add things to the list when you notice something that needs to be addressed, and change consequences that don’t seem to be effective, thus the pencil. (Just be sure the kids understand the changes you’ve made.) This simple little chart has been a real life-saver for me over at Riggstown Road, where I’m always on the lookout for creative ways to do things. I’d love to hear your ideas on what to do when you don’t know what to do, too! 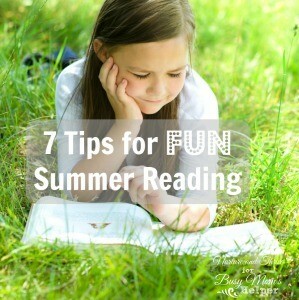 7 Tips for FUN Summer Reading! June 5, 2015 by Ashley Soderlund Ph.D.
Hello again Busy Moms! I’m excited it is almost summer and I plan to take full advantage of all summer has to offer. One of my favorite things to do is to read some really good and fun books over the summer and I want to share that with my son. Here are some ways to instill a love of reading in your children this summer. The loss of reading skills over the summer is a real problem. The National Assessment of Educational Progress (NAEP; 2002) reported that for fourth graders, 58% of children from lower incomes and 27% of children from higher incomes fell below basic reading levels over the summer. The great news is that summer reading can be fun and simple to do. Here are 7 tips for fun summer reading! 1.Read Aloud Everyday to your Younger (and older!) Children. Reading aloud to your child is one of the best things you can do for their cognitive development. Research with identical twins (thus ruling out other explanations) shows a causal link between reading ability and better verbal and general intelligence over time. It is a benefit that lasts a lifetime. This isn’t limited to just young children either, reading with older children (or perhaps taking turns reading a chapter book together) can be beneficial as well. You could also read the same book your older child is reading and discuss it together. 2. Make Storytime Really Count. When reading aloud to your children engage them in the story. Ask them questions about what happens next or how the character feels. This kind of interaction helps young children began to learn how to tell a story and the process of reading. Research shows that when parents use a more interactive reading style their children show significantly better literacy skills. For more on interactive reading and a handy printable with types of prompts to ask your children click here! 3. Join your local library’s summer reading program. Most local libraries have summer reading programs (this year it’s all about superheros! ), storytimes, and fun related activities. Our local library has an annual summer reading kick off party that really gets kids excited. You can find this year’s summer reading list here. It’s always nice on a hot day to go to the library and pick out some new books to read. If going to the library isn’t practical for you, consider an online program, like the Scholastic Summer Reading Challenge. 4. Bring Books with you on Your Summer Outings. When you go to the park, on a nature walk, to the pool, or even just to the backyard bring a small book or two. Once your kids are tired after running around at the park, how about hanging out at the picnic table and reading while having a snack? Or on a nature walk, take a break and read a fun story. Summer is for being outside; bring your books outside too! 5. Read about something you are going to do this summer. Maybe you are going to the Zoo, planning a trip to Grandma’s, flying on a plane, taking a roadtrip, going to the beach, having a picnic, or going camping—whatever your summer plans, grab a few related books and talk up the experience. Research actually shows that spending money on experiences makes us happier than buying things and reading about those fun activities can help your children to enjoy those experiences that much longer! 6. Make a book together! After some of those fun summer outings, gather the photos and make a book about it. This is a great way to encourage kids to learn to tell a story. I’m planning for my son and I to make a road trip book with our photos from our vacation this summer. We will design it and write captions on the pages together. Keep this in mind before you go on your trips or outings so you remember to take pictures of things you might not otherwise. For example, you might want a few extra pictures of animals at the Zoo or some of the big trucks you see on a road trip. You can do this with materials from around your house or you could use one of these websites and make a cute keepsake! In the car or during quiet time (my favorite)! I especially love read alongs for younger emerging readers. My son will follow along with the pages even though he isn’t reading on his own yet. I think this is a good step towards independent reading. We get our read alongs at the library every so often, so they are always fresh and interesting and I get a little break on these sometimes long summer days.